The final novel in the magisterial Underworld USA Trilogy. It's 1968. Bobby Kennedy and Martin Luther King are dead. The Mob, Howard Hughes and J Edgar Hoover are in a struggle for America's soul, drawing into their murderous conspiracies the dammed and the soon-to-be damned. Wayne Tedrow Jr.: parricide, assassin, dope cooker, mouthpiece for all sides, loyal to none. His journey will take him away from the darkness and into an even greater darkness. Dwight Holly: Hoover's enforcer and hellish conspirator in terrible crimes. As Hoover's power wanes his destiny lurches towards Richard Nixon and self-annihilation. Don Crutchfield: is a kid, a nobody, a wheelman and a private detective who stumbles upon an ungodly conspiracy from which he and the country may never recover. All three men are drawn to women on the opposite side of the political and moral spectrum; all are compromised and ripe for destruction. Only one of them will survive. The final part of James Ellroy's Underworld USA trilogy is set during the social and political upheaval of 1968-72. 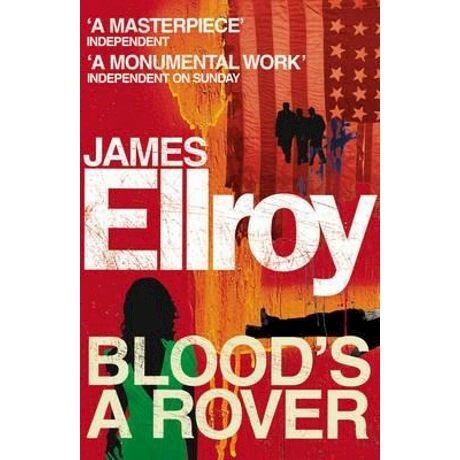 Blood's a Rover is an incandescent fusion of fact and fiction and is James Ellroy's greatest masterpiece.